MARTA Board of Directors strongly supports the participation of Disadvantaged Business Enterprises. Our program is based on 49CFR26. The Office of Diversity and Inclusion is responsible for assuring that all vendors are treated equitably in accordance with Federal laws and regulations governing the participation of Disadvantaged Business Enterprises. In addition we assist Disadvantaged Businesses (small, minority and women owned companies) in obtaining opportunities with MARTA procurement of goods and services. To assist in the development of firms that can compete successfully in the marketplace outside the DBE program. For Federal Fiscal Years 2018-2020, MARTA established a DBE program goal of 23%; 20% race conscious; and 3% race neutral. MARTA intends to award at least 23% of its total DOT-assisted contracts with qualified DBE firms through race conscious and race neutral means. Any additional groups whose members are designated as socially and economically disadvantaged by the Small Business Administration (SBA) and has a personal net worth not to exceed $1.32 million (minus the value of their principal residence and interest in the business). WHAT DOES SOCIALLY DISADVANTAGE MEAN? (C) Negative impact on entry into or advancement in the business world because of the disadvantage. WHAT DOES ECONOMIC DISADVANTAGE MEAN? Economically disadvantaged individuals are socially disadvantaged individuals whose ability to compete in the free enterprise system has been impaired due to diminished capital and credit opportunities as compared to others in the same or similar line of business who are not socially disadvantaged. Each individual claiming economic disadvantage must describe the conditions which are the basis for the claim in a narrative statement, and must submit personal financial information. What is the Disadvantaged Business Enterprise (DBE) Program? MARTA Board of Directors issued it second Board policy statement in support of equal opportunity for minority and women owned businesses in 1971. Federal regulations were developed to provide additional detail. Businesses must apply for certification and provide evidence of ownership and control by the minority person(s) as part of the DBE certification process. What is a Disadvantaged Business Enterprise (DBE)? A DBE is a business that is at least 5l % owned and controlled by one or more minority persons. A minority is generally defined as an individual who is African American, Hispanic American, Asian American, Native American, or a Woman. The Federal Government DBE Program also includes Alaskan Natives, Pacific Islanders, Aleuts, and persons who are not minorities but who are socially and economically disadvantaged in its definition. The socially and economically disadvantaged owners must demonstrate longstanding, chronic and substantial disadvantage since the business is not owned by persons in the cited minority groups. How does MARTA determine which businesses can participate in the DBE Program? MARTA has a very comprehensive certification process to determine the ownership and control of firms, which apply for DBE certification. There are many specific eligibility criteria for certification. In assessing ownership, investments by the minority owner are important. Control includes both managerial and operational control with technical knowledge of the firm major areas of work being an important component for assessing operational control. Applications are carefully reviewed and personal interviews are conducted by trained DBE Analysts. The entire certification process assures that only bona fide DBEs participate in the program. Why does MARTA Require a Personal Net Worth Statement? The U. S. Department of Transportation (USDOT) Disadvantaged Business Enterprise (DBE) program has added a new requirement for qualifying as a DBE; the personal net worth (PNW) of each minority individual who owns and controls the firm as a part of the 51 % minority ownership must be less than $1,320,000. When an individual personal net worth exceeds the $1,320,000 threshold, the individual is no longer eligible to participate in the Federal DBE Program. DBE business owners may decide not to provide a PNW and not be considered a DBE for USDOT assisted contracts. The PNW excludes the value of the DBE business and the personal residence of the DBE owner(s). Do firms graduate from the DBE Program? Yes. If a certified DBE has a three (3) year annual average of gross receipts (or for retail and manufacturing businesses number of employees) that meets or exceeds the revenue (or employee) totals as specified by the U.S. Small Business Administration for the NAICS codes in which it is situated, the firm will not be eligible to participate in the DBE program. What are the advantages of becoming certified as an DBE? Certification as a DBE provides greater exposure for work opportunities on MARTA projects. The names of all certified DBEs appear in the DBE Directory, a reference manual which is widely disseminated to each MARTA administration, other state departments, local governments, contractors and to the public. Contractors use the DBE Directory as a basic resource for soliciting minority participation on projects. If a firm is not certified, a contractor cannot receive credit toward achievement of the DBE participation goal by using that firm. Will this certification allow me to bid as a DBE on other federally funded contracts? MARTA DBE certification program is generally accepted by other agencies. 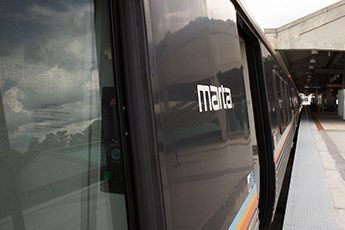 Once you are certified through the Georgia Unified Certification Program (GUCP), you may participate as a DBE subcontractor on any MARTA contract. Any business may bid directly on any bid or proposal without regard to certification. How does MARTA establish the goals for disadvantaged business participation? Every attempt is made by MARTA to establish realistic and achievable DBE goals. Individual contract goals are set based upon the dollar value of the project, the availability of DBEs to perform the work which is to be subcontracted, and the availability of certified DBEs in the location where the work is to be done. What types of work is available? Opportunities to participate in construction work, construction-related work and the procurement of goods and services are varied. Disadvantaged Business Enterprise participation is encouraged on all projects. Although many contracts with DBEs are for sub-contract work, certified DBEs have leased concessions, provided consultant services in technical fields and have been awarded projects as prime contractors, as well. Once certified, can a firm be assured of getting contracts and subcontracts? No. Certification does not guarantee work to a DBE; however, it does enhance a DBEs exposure to prime contractors and the business community. To be successful, a firm must market itself, its personnel and its services, as any good business should. What is expected of the DBE once a contract is awarded? All firms are expected to meet performance standards as established by contract specifications. This relates to the quality of work done, the submission of reports and written information in a timely manner and the firm compliance with applicable regulations and laws. Once a DBE has been awarded a prime, sub or lower tier contract, the DBE is responsible for submitting verification of all payments received to the contracting agency. This includes the amount of payment and date received. Does the general contractor have any responsibility in the DBE Program? Yes. The general contractor must first meet the DBE goals established on the contract by seeking out and utilizing certified DBEs. Once work begins, the general contractor is responsible for all project activities including those of subcontractors and lower tier contractors. Regular monitoring assures that contractual items are performed in accordance with specifications. Monthly reports must be submitted by the general contractor such as payroll, cost and time estimation and progress reports. When changes are needed, the general contractor must get approval from the agency project manager. Any changes in the DBE participation must be approved by the Executive Director of the Office of Diversity and Inclusion in writing before any actions in this connection are initiated. How can MARTA assist DBEs who work on transportation contracts and projects? DBEs can receive technical assistance when experiencing difficulties in business operations. A call to MARTA Office of Diversity and Inclusion, will guarantee that an EEO/DBE Analyst will contact the DBE to set up an appointment to provide assistance in business management, construction management and/or financial guidance. The Analyst may also assist in resolving problems on the job site such as labor disputes, project scheduling and equipment rental issues. How does MARTA assure that "fronts" or "sham" organizations do not benefit from the DBE Program? The DBE certification process is used to determine if a firm is minority owned and controlled. To qualify as a DBE, the owner must demonstrate that he or she is a minority person and provide documentation establishing at least 51 % ownership of the company. Once the ownership of a firm is established, the business owner must demonstrate the technical knowledge and experience to make independent business operating and management decisions. Annual reviews of all certified firms are made to determine if the ownership and control of the DBE has changed. Effective contract compliance monitoring procedures also facilitate the identification of "front" or "sham" DBE firms. How can suspected abuse of the DBE Program be reported? Suspected abuse should be reported to the Office of Diversity and Inclusion at supplierdiversity@itsmarta.com. What happens to DBEs and general contractors who have abused the DBE Program? Where can I find information on upcoming contract opportunities?